The Newfoundland dog is a well-known symbol of the province. Its origins are obscure, with different theories citing the Basques, Norse and other settlers as those who introduced this large dog to the island. This photo of the Newfoundland dog, 'Westerland Sirius' appeared in the magazine Newfoundland, which was published by the Newfoundland Tourist Development Board in 1930. Photo by Robert E. Holloway. Reproduced by the permission of the Maritime History Archive (PF-035.003), Memorial University of Newfoundland, St. John's, NL. The Newfoundland dog is famed for its bravery, gentle temperament and strong swimming abilities. It has a stiff, oily outer coat and a fleecy undercoat that allows it to adapt to harsh, wet conditions. Its tight eyelids and drop ears keep out water, and its webbed feet are an ideal swimming aid. Adult males weigh approximately 68 kg, females around 52 kg. Because of their physique, Newfoundland dogs were frequent companions aboard fishing vessels, where they helped to haul nets, and retrieve objects and persons from the water. Because of their size and their life-saving instincts, they can easily pull drowning persons to safety. Their lung capacity enables them to swim long distances while fighting powerful ocean currents. Newfoundland dogs have proven to be useful on land as well. They were often hitched to carts loaded with fish, and because they can move over 900 kg, they pulled wagons that delivered milk and mail. Despite their usefulness, their numbers declined until the early 20th century when the Hon. Harold Macpherson established a kennel in St. John's to protect them from extinction. Today the Newfoundland dog enjoys immense popularity around the world. 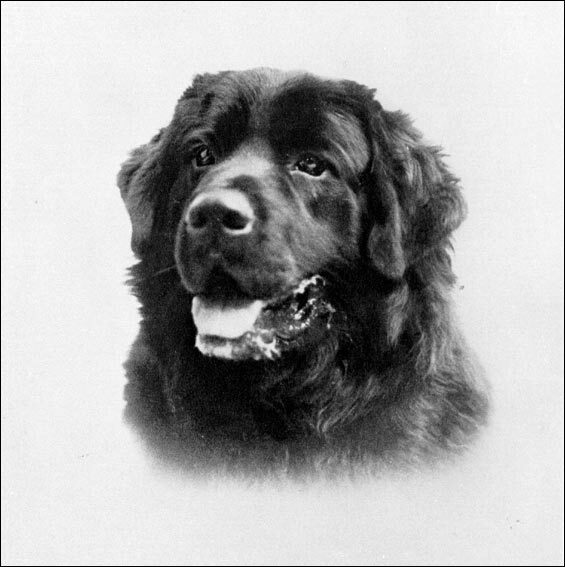 This descendant of the Newfoundland dog is believed to have originated on the island and not in Labrador, as the name suggests. The name "Labrador" was given to this dog by British breeders in order to differentiate between the two types of dog. The retriever was originally called the "lesser Newfoundland" or the "St. John's dog." 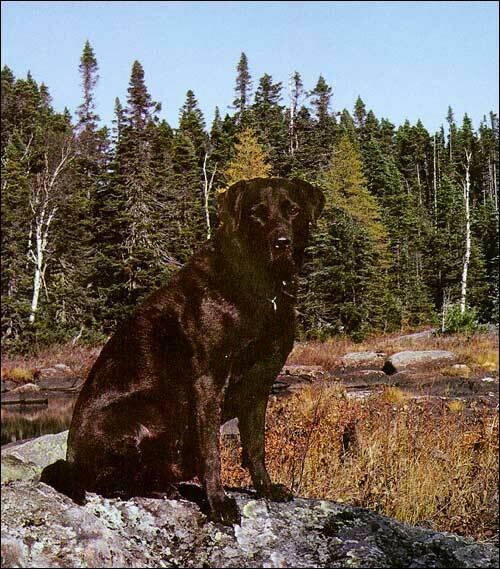 Brian Bursey's Labrador Retriever "Triton"
Reproduced by permission of Brian Bursey. From Brian C. Bursey, Exploring Newfoundland (St. John's: Harry Cuff Publications, ©1989) 48. Weighing between 25 and 34 kg, these small water dogs were found to be natural retrievers. They were shipped to England, where the breed was officially recognized by the English Kennel Club in 1903. This dog is known around the world for its playful and friendly nature. 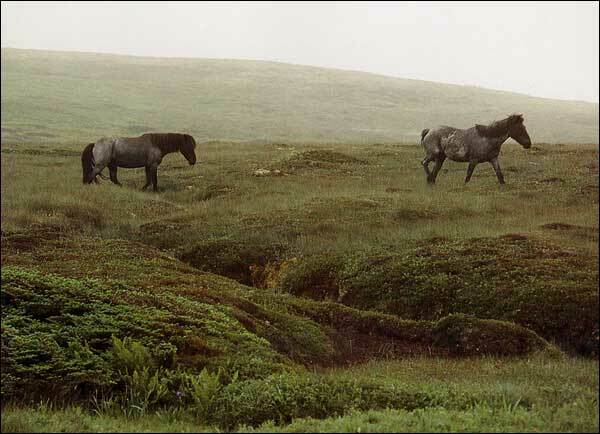 Newfoundland ponies probably derive from breeds brought from Europe in the early 17th century, following which they adapted to Newfoundland's harsh climate and conditions. The ponies were used to haul boats out of the water, pull logs from the forest and to prepare land for spring planting. Quiet animals with good temperaments, they are good workers, easy keepers and great family pets. Reproduced by permission of John de Visser. From Harold Horwood and John de Visser, Historic Newfoundland (Toronto: Oxford University Press, ©1986). Since Confederation, cross-breeding and neglect have driven the pony to near extinction; fewer than 200 remained in 2015. Recently, concerned Newfoundlanders have been making efforts to reverse this trend. Possibly the oldest breed of domesticated livestock in North America, the Newfoundland pony has been declared a heritage animal. Newfoundland ponies weigh between 227-454 kg, and stand approximately 14.2 hands (147 cm) high. Their coats are bay, brown, black or red with black forelocks, manes and tails. Their lower legs are solid black, and they sometimes have a black stripe along their backs. Hooves are blue-black with a very hard outer horn. Winter coats generally grow to 5-7 cm and are a different colour from the summer coats. The above information was compiled from a variety of sources by Wendy Churchill, Alex Dalziel, Vanessa Rice. The information contained in this article is accurate to April 2015. Image of Newfoundland dog added October 2015.